The UCLA neuroendoscopy team has treated hundreds of patients since 1993 using this technique. The neuroendoscope can be used to perform the entire minimally invasive operation, often through a small hole less than the size of a dime, or in combination with the surgical microscope (endoscope-assisted). Upper limb sympathetic mediated pain. Neuroendoscopy uses small telescopes and high resolution video cameras to look into the skull, brain and spine. Working with these endoscopes, it is now possible to perform many microsurgical operations. This minimally invasive neurosurgery has the distinct advantages of a small incision site and minimal trauma to the brain or spinal cord, resulting in a shorter hospital stay for patients and a quicker return to normal activities. In some instances, the surgery is substantially shorter than traditional surgical approaches, and in many cases hospitalization and recovery is shortened. 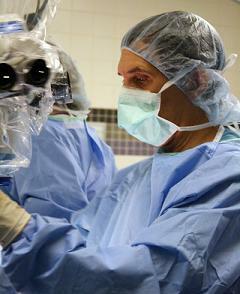 In selected cases, laser energy is used for tumor or cyst surgery. The UCLA neuroendoscopy team is developing new endoscopes and other surgical instruments.